Opening from 10am to 10pm. The Atrium bar occupies a prime position looking down on Piso Krioni beach (better know to the tourists as 'Golfo beach') and you get to it via a windy set of steps in the hillside at. The town end of the beach. A cheerful sign as you get close states, "only a few more steps - you can do it!" And it's well worth the little climb for the lovely views back down onto the beach. I just stopped for a small beer, but that was served with a small mezze of bread with taramasalata and some cucumber, and the do serve more substantial food up there too. 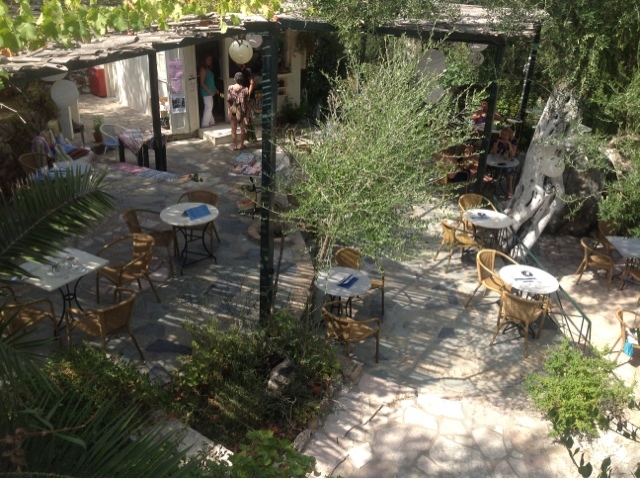 It's shaded by the branches of old olive trees and some bamboo canopies and is has a fair chilled out beach bar feel to it. OK, the music is on the naff club lounge style of chilled (I didn't think 'Smooth Operator' could get more 'lounge' than the original, but the Greek cover version proved me wrong, as did, 'Love iz in dee air') but each to their own taste, and it is an otherwise fairly minor criticism of a lovely little bar.